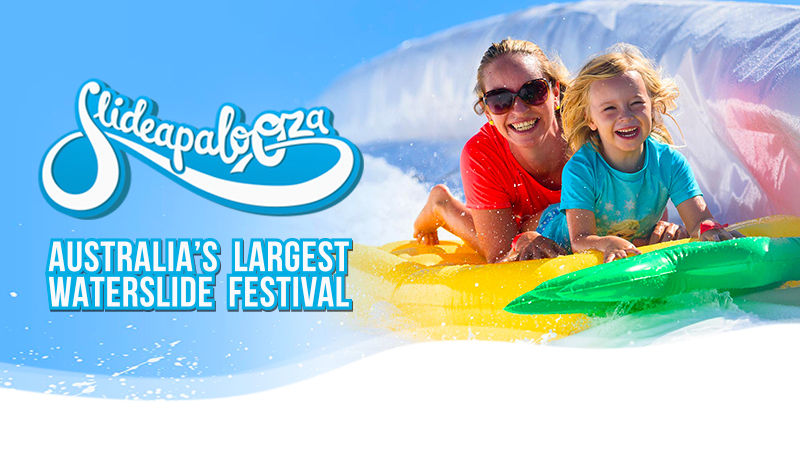 Slideapalooza brings you Australia’s largest waterslide festival! See your city transformed into a summer paradise with our collection of mammoth inflatable waterslides and Slip ‘N’ Slides so big they need to be seen to be believed. Note: Participants under the age of 18 must be accompanied to the event by a parent/guardian over the age of 18 years. An indemnity must be signed by the parent/guardian before a participant under the age of 18 can participate in the event. Children 0-13 years of age must be accompanied on slides by a person over the age of 16. Adult (18+): 2 amazing hours of non-stop sliding across all the slides on offer at Slideapalooza. Arrive 1 hour early to make sure you’re ready to hit those slides running when your session starts! Child (5-17 yrs): 2 hours of non-stop sliding for the kids too! Slides are regulated by height restrictions (more here: www.slideapalooza.com/our-slides), but as long as you meet the height requirement you can slip and slide your way through your session. Kids that don’t meet the height restriction for the bigger slides can slide their way into the Kids Zone. Mini (0-4 yrs): Our Minis can have an action packed session in our Kids Zone or slide with an Adult slider on the Slip ‘N’ Slides. Spectator (All Ages): The Spectator Pass will give you access to the main festival area for the full day as well as all slide observation areas. The Spectator pass does not provide access to the slide areas, however a Spectator can accompany a Mini in the Kids Zone. Why add ‘Credit’ to my ticket? Slideapalooza is a cashless event. Save time by purchasing credit to spend at the festival now with your tickets. Rest assured, any unused credit will be refunded back to you after the close of the festival in line with our refund policy. If you purchase credit with your ticket purchase, your credit will automatically show up in your Slide Account once you create your account and Activate your ticket. You will then swap your ticket for a wristband on arrival and be able to leave your wallet locked tightly in the car (with exception to your ID if you’re looking to grab a refreshing beverage at one of our bars). What should I bring with me to Slideapalooza? Bring the beach basics – swimmers, towel, change of clothes, sunscreen, hat and sunglasses to ensure you are safe in the sun. It is suggested to wear your swimwear to the festival so you’re ready to go. Please note there are no change rooms, only toilets are available for changing clothes. Aqua shoes or thongs are the best footwear to move from slide to slide. An inflatable device – basic slide rings or pool toys are the only permitted slide devices and will need to be under 1m in width. You can inflate them at our inflation station. It is essential to bring your proof of age card for all adult tickets. If you look younger than 25, we will ask for valid photo ID in the licensed areas. © 2019 Ticketbooth on behalf of Slideapalooza Pty Ltd.. All sales are final. Tickets are non-refundable.